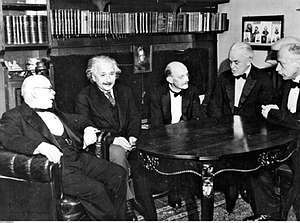 Albert Einstein in a circle of other Nobel Prize Winners in 1928 (from the left Walther Nernst, Albert Einstein, Max Planck, Robert Andrews Millikan and Max von Laue). If you google "Muslim/Islamic/Arab Nobel Prize Winners" you will invariably get quite a number of websites that erroneously list ten or eleven names. They are far too generous. 1979 - Abdus Salam - Punjabi Ahmadiyya sect. 2015 - Aziz Sancar - a Turkish and American biochemist and molecular biologist. I'm not sure yet if he is Muslim or not. First off, I ignore the Nobel Peace Prize since one can be a village idiot and get one; Yasser Arafat is a perfect example. Albert Camus, neither Arab nor Muslim, happened to have been born in Algeria which at that time was a French Colony; his father was French, his mother - Spanish. An accurate ethnic designation for Camus is pied noir. Elias James Corey, neither Arab nor Muslim, was born and raised in America of Lebanese Christian Phoenicians. Many Christian Lebanese do not identify themselves as Arab but rather as descendants of the ancient Canaanites and prefer to be called Phoenicians. Sir Peter Brian Medawar, neither Arab nor Muslim, was born in Brazil of a British mother and a Lebanese Christian father. Medawar was raised and educated in the UK and was in fact an atheist. Ferid Murad, neither Arab nor Muslim, was born and raised in America of an Albanian Muslim father and an American Baptist mother. Murad was baptized Episcopalian in college, his wife is Presbyterian, and two of his daughters married Jews. This leaves Naguib Mahfouz, Abdus Salam, Ahmed Zewail, Orhan Pamuk and Aziz Sancar. So four five Muslims won the Nobel Prize in Science and literature. Out of 1.2-1.5 billion Muslims. It should be noted that Abdus Salam was born in British India, in what is now Pakistan, and although listed as Pakistani, was ethnically a Punjabi. Mahfouz and Zewail however are both Arab. 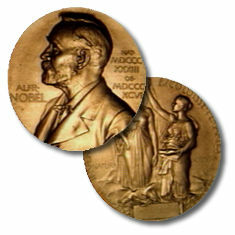 That means that two Arabs won the Nobel Prize in Science and literature. Out of 300 million Arabs. A further note on Professor Salam, he was educated at Punjab University, St. John's College, Cambridge and Cavendish Laboratory, Cambridge where he obtained his Ph.D. in 1952. He then returned to Pakistan where he served as Professor at Government College, Lahore and Punjab University. It was here that he found intellectual pursuits being stifled. There was no postgraduate work of any value; there were no journals written; there were no scientific conferences. Given the choice between physics or Pakistan, he returned to Cambridge to take up the position of Lecturer. In 1957 he was appointed Full Professor of Theoretical Physics at Imperial College. Certainly if he stayed in Pakistan he would never have accomplished anything of note, nor would he ever have won a Nobel Prize. Salam holds the distinction of being the first Pakistani Nobel Laureate, and is the first Muslim Nobel Laureate in science. It should also be pointed out that of the four Muslims only Salam was devout. Mahfouz and Zewail were brought up in a secular environment. Zewail is Muslim in name only. Mahfouz in fact was stabbed by Muslims for his anti-Islamic mutterings. Both Zawail and Salam did their research in non-Muslim countries and spent almost the entirety of their lives outside of Islamic countries. So much for "Muslim" Nobel Prize Winners. I doubt any of Zawail's colleagues ever think of him as Muslim. Sadly, Abdus Salam, being an Ahmadiyya Muslim, is not considered a true Muslim by Pakistanis. The National Assembly of Pakistan having legally declared the Qadianis a non-Muslim minority on Sept. 7, 1974, expelled them from the Muslim religion and entered their name in the list of non-Muslim inhabitants of the country. This legal decree is a mortal blow for them and has successfully killed their infectious germs from blossoming. Interestingly, according to their religion, observant Muslims cannot ever accept money from the Nobel Prize since the award is actually pure interest earned on the original Nobel fortune. Islamic Law forbids either the paying or receiving of interest. As to the Peace Prize, although I consider it irrelevant to intelligence, it is noteworthy that Shirin Ebadi's Peace Prize was awarded precisely for being anti-Islamic: promoting human rights and democracy in Iran. But for those who persist in being technical as to how many Muslims won a Nobel Prize: OK, OK, Updated total: 9 (of which 5 [Peace] do not involve creativity at all) - if that makes you feel better (but it's really only four or three if you omit Abdus Salam). No wonder Muslims hate Jews: It's so embarrassing to see what Jews have accomplished compared to a population 100 times larger. But in some respects one may wonder if indeed Jews control the world - it seems they control the Nobel Prize Awards Committee. Search engine giant Google recently acquired an advanced text search algorithm invented by Ori Alon, an Israeli student. Orion, as it is called, which Alon developed with faculty, relates only to the most relevant textual results. In addition the software, which currently operates only in English, offers a list of topics directly related to the original source.